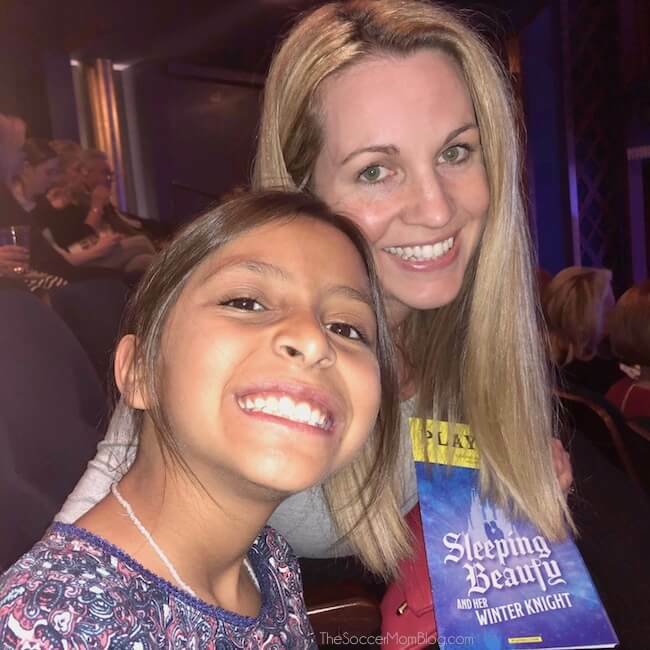 We were honored to be guests at opening night of Lythgoe Family Panto’s production of “Sleeping Beauty And Her Winter Knight” at Theatre Under The Stars! Here’s what to expect and why you should make a holiday panto your new family tradition! 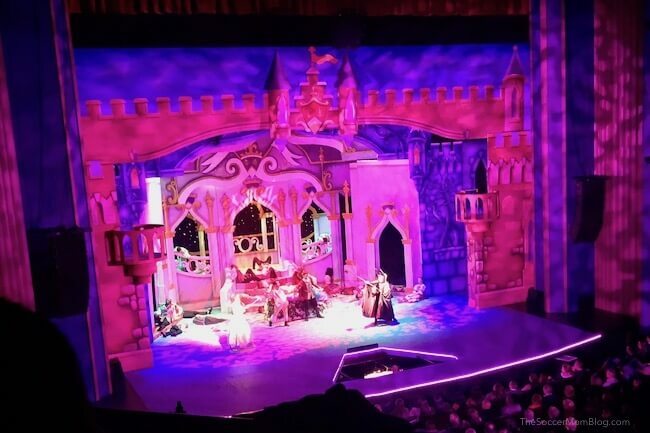 This week my husband, oldest daughter, and I were invited to attend the opening night of Lythgoe Family Panto’s production of “Sleeping Beauty And Her Winter Knight” at Theatre Under The Stars. You probably know the story of Sleeping Beauty, but you’ve never seen it like this! Set to catchy pop music and against an absolutely breathtaking array of backdrops, this performance is an event for all your senses. There was even “snow” falling at the end! It’s on the longer side at about 2 hours run time (I didn’t check my watch too often, but that’s my best guest); however, my 9-year old daughter was thoroughly entertained the entire time. I loved how her face lit up as she cheered and jeered with the rest of the crowd and how she danced in her seat to some of her favorite songs. Another fun surprise: the show revolves around Houston, with lots of funny jokes and references that only Houstonians will appreciate. The cast and crew really went all out to make this special! I really hope that they do another show next year, whether this one or another classic story. I can see this being a new family holiday tradition! Buy 4 Tickets for a special package price of $99 at www.tuts.com or by calling the box office at (713) 558-8887*. *Service & Handling Fees Apply. Subject to Availability. Cannot be combined with any other offer. Blackout dates apply. This was my first time attending a panto (aka a pantomime), so I didn’t quite know what to expect. The high energy performance and audience interaction was an awesome surprise! If you have an opportunity to see this show, or another panto, I encourage you to go! This is a star-studded cast, and it was fun to see actors and singers I’ve followed on televisions for years. Vonzell Solomon – I remember rooting for her on one of the early seasons of American Idol! 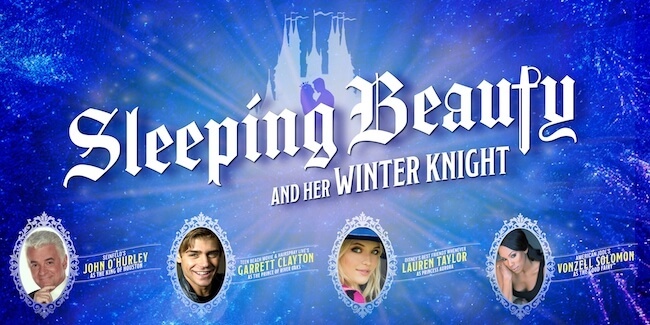 Enter to win a family 4-pack of tickets to see Lythgoe Family Panto’s production of “Sleeping Beauty And Her Winter Knight” at Theatre Under The Stars. Giveaway has ended. Thank you to all who entered! Click here to see more Houston events on The Soccer Mom Blog! Disclosure: We were provided with complimentary tickets in exchange for an honest review. Aly loves the theater- I hope we can go! Looks like it was such a great show!